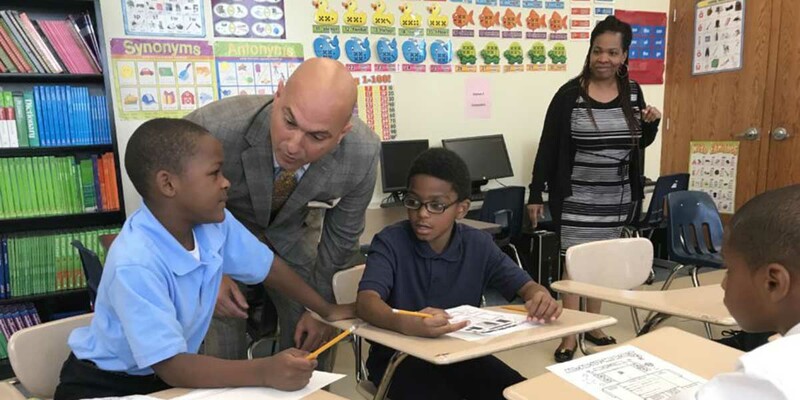 Detroit Public Schools Community District Superintendent Nikolai Vitti announced last month that every school will offer art and gym next year for the first time in years. The good news: He has money to hire the teachers. The bad: He hasn’t found enough, so the district is searching all over the nation. Related: Hundreds of Michigan schools don’t have a gym teacher. Does yours? The district is fanning out to historically-black college campuses across the nation over the next several weeks in addition to continuing to hold year-round job fairs to try to fill 180 teacher vacancies. The district started the school year this fall with 2,000 teachers and about 250 vacancies. The shortage means that each of the 100-plus schools in the system are short one to two teachers on average, creating overcrowded classrooms with more than 40 students in some cases. Vitti’s proposal to ensure the schools will all have a counselor, dean, arts or music teacher and gym teacher next year means the district will have another 200 teaching positions to fill for next school year, Ivy Bailey, president of the teachers’ union estimated. Bailey also said she expects a large group of retirees this year. The district hosted a K-8 Teacher Recruitment Fair in Detroit on Feb. 27 as part of the search for certified educators. Qualified teachers could get on-the-spot conditional job offers. It was one in a string of job fairs over the past two years, and one of several the district’s recruiters have attended across the country this year. District recruiters have visited colleges in Alabama, West Virginia and Ohio recently looking for teacher candidates. The district has “an extensive out-state recruitment schedule that spans March and April. We have on-going teacher recruitment efforts to close our shortage gap,” said Chrystal Wilson, spokeswoman for the district. Detroit’s struggle to find teachers is a result of retirements, attrition and competition with other school systems. The teacher shortage is a statewide problem, but Detroit public schools have had a particularly tough time recruiting because its classrooms often are a high-stress environment: The district has the lowest test scores among big cities on the Nation’s Report Card, and teachers get less money than in suburban districts. The top pay scale in Detroit is $65,000 for teachers with 10 or more years’ experience. At some suburban schools, teachers with similar experience can make $25,000 or more per year. “We’re not ranked last, but we’re next to last,” among districts in the tri-county area around Detroit, Bailey said. Vitti is in negotiations with the union to amend the contract so the schools can hire veteran teachers at a competitive pay rate. Currently, the Detroit teachers’ contract dictates the district has to pay new teachers a beginner’s salary, even veterans who worked for more than a decade in another school system. Part of the reason for that stipulation is the current teaching corps is full of veteran teachers whose salary has been frozen for years. To hire new teachers and pay them more than veteran teachers who have stuck with the district would cause a backlash, union officials have said. But in an attempt to make district more attractive and address morale problems, Vitti and the teachers agreed to a three-year contract for 2017-19 that provided a 3 percent raise this year, a 4 percent raise next school year and a $1,750 raise for the top-paid teachers. It was the first raise in about a decade for teachers who each loaned the district $10,000 each about eight years ago only to take a 10 percent pay cut and see health care costs rise in subsequent years. Not filling the vacancies means that there’s about $9 million a year that the district is not paying out. Bailey is skeptical the district will be able to soon find enough people to fill the positions with the current budget. One comment says it all about the inability to hire teachers in Detroit. The high classroom stress. Twenty something years ago I volunteered to assist the DAPCEP program in a middle school in Detroit. Probably only had about 20% of the class interested in doing anything. The classroom teacher saw my weekly 2 hour session as a way to step out of the classroom, even though she was supposed to be there to handle the disciplinary problems, structure the kids, etc. After my one year I said enough of this. You can give the horse a river of water to drink, but if the horse does not drink the water, it will die. I bet Detroit teachers make more than Oklahoma teachers do. Oklahoma might be the best place for recruitment efforts. I don't think so. The benefits here are not good either. 36000 for a beginning teacher with 20 percent copays for insurance coverage and more for actually using it, lousy working conditions, schools in worse shape than theirs, and a legislature with the same stupid agenda. Not a change for them; just more of the same crap. Students and teachers need to be rewarded for improved graduation rates, attendance, preparation for employment, etc. Instead, they are punished for low scores on tests designed solely to assess college readiness. That unrealistic and punitive approach does not attract teachers or increase graduation rates.